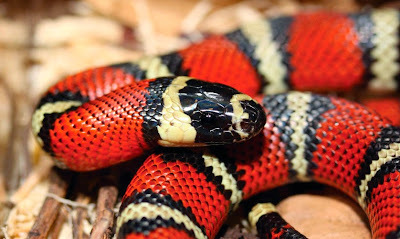 Not this milk snake, Lampropeltis triangulum hondurensis, which originates from Central America and whose name derives from the myth that it drinks milk from grazing cows. But this equally eye-catching one, found on the Tesco shelves in Terenure, Ireland. I know which one I'd rather face. After all, the milk snake is harmless to humans. Unlike the packaging design which could scar you for life.